More than a decade after their famous self-titled debut, HAFGS emerge from their cave with a luscious assemblage of nefarious soul-sucking sweetness. Patrick Swayze is the inspiration, making this an audio statement to a time past, to a way of making music, and to an entire sensibility. It is also that rare mythological beast—a walking, breathing hypercube of feelings; how can you be postmodernly derisive and truly respectful at the same time, paying honest tribute to the target of your mockery? Well, love is the answer, and this record reeks of love in every sample and every break. There’s no ghost in this machine, just a fleshy, pulsating, radiant heart. http://charlotteskitchendiary.com/2015/04/04/wheaten-bread/ “Five Alive” is an electro-soul-step voyage to a funkier and sexier time, where you can almost taste the sweat in the crispiness of the rhythm. “Epidemic” sounds as if Amon Tobin had a few and then some more: tight, smooth, and sad with a pinch of breakcore-ish distortion and use of movie sampling that can only be described as magical. 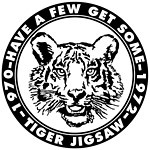 And this is part of the trick here—Tiger Jigsaw takes sampling to new heavenly wells of nostalgia and back to the futuristic present; it feels so seamless you might think this whole record was made in a frenzied ouija session with Swayze redoing his lines live in a studio somewhere in the backwoods. Take “Colon” as a distillation of what this record and these producers are about: “It’s about the passion and belief in what you do.” And it shows, and you can listen and dance to it. Swayze inspired Joshua Jenquin and Marty Frank to make one of the funkiest records of 2012 and beyond. This is classic, fun, deep, groovy, breaks and sample music—a bold statement, an unsolicited lesson, an expression of love.